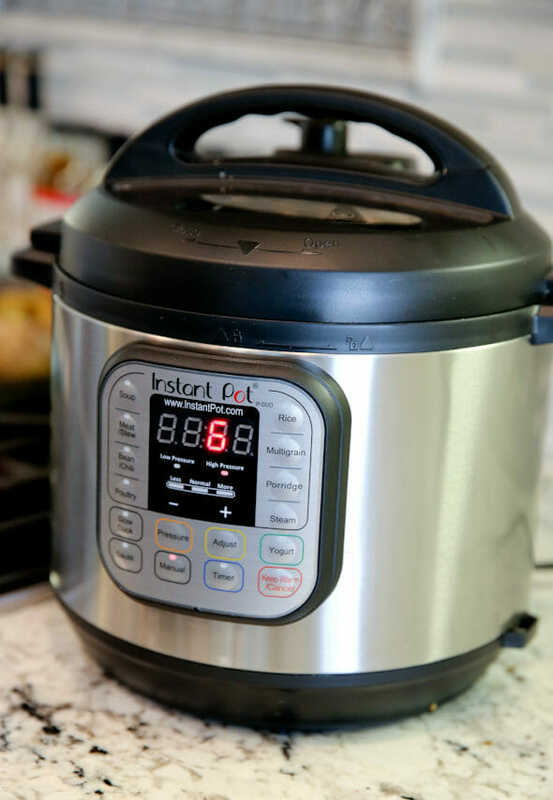 I’m continuing to love my Instant Pot Electric pressure cooker, and as requested, I have another recipe for ya! 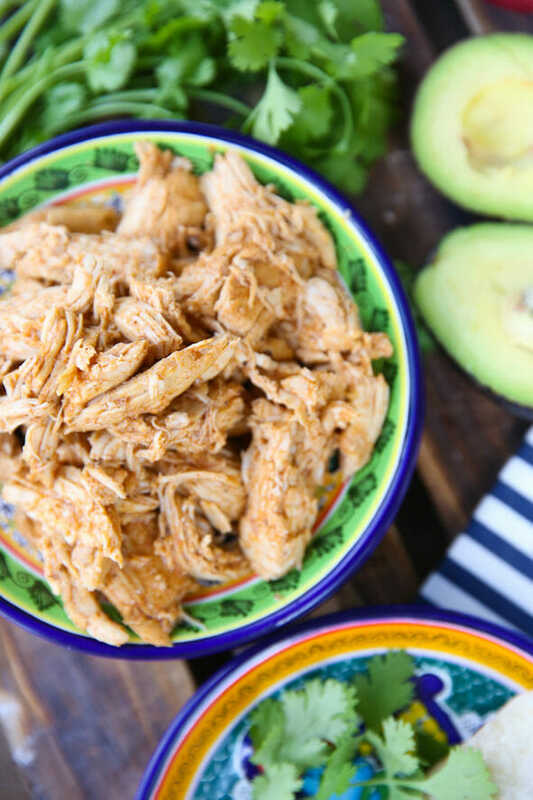 If you don’t have a pressure cooker- don’t turn away, this is still a great recipe that you could use with any other cooking method so stick with me. The first few times I cooked boneless, skinless chicken in my pressure cooker, I was disappointed. It always had a funny texture; kind of dry and mealy- similar to when you overcook it in a slowcooker. After several trial and error experiences, I finally figured out I was cooking it waaaaay too long. For me, the magic number has been 6. Six minutes under high pressure and I get perfectly cooked, juicy, flavorful chicken that my family loves. I also discovered that I didn’t need lots of extra moisture, like broth. When extra liquid was added, it simply diluted the flavors and turned quite soupy. I put this chicken in without any additional fat; simply a squeeze of fresh lime juice and a handful of seasonings. It results in the perfect amount of flavor-packed juices to toss the chicken in. Although I make this a lot for dinners, I also love to make it simply to keep in my fridge for quick meals during the week. I posted this pic on our health and fitness Instagram account, @ourbestbites_fitclub and I’m probably going to eat it again every day this week because it was so good! If you don’t have a pressure cooker, you can still use this same rub and just toss your chicken on the grill or under the broiler. 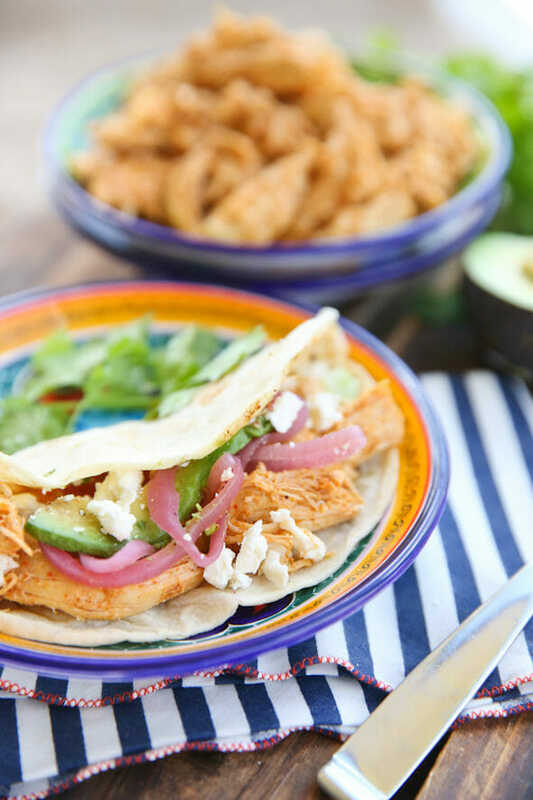 It’s very similar to this Grilled Taco Chicken that we love. This recipe was born and stays a go-to week night recipe for me because these are things I always have on hand. 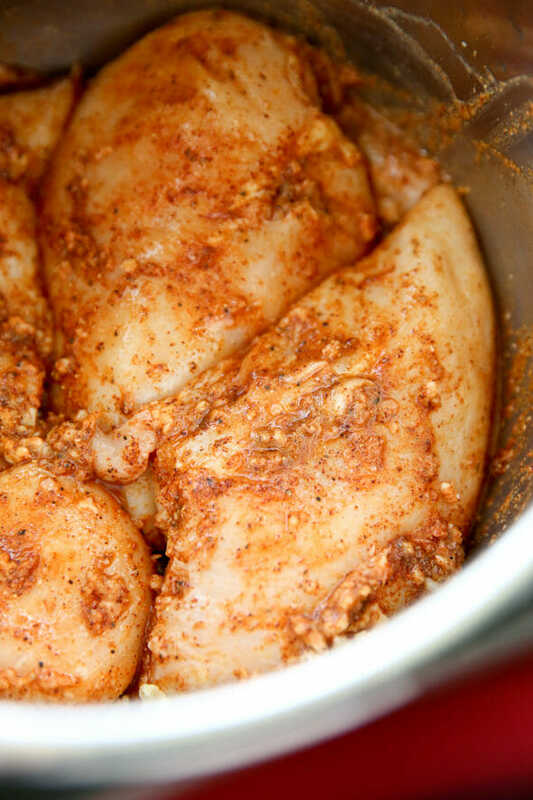 I just toss boneless, skinless chicken breasts into my pressure cooker and squeeze a lime over it, then add chili powder, cumin, onion powder, salt and pepper, and some fresh minced garlic. You could even use garlic powder if you didn’t have fresh garlic on hand. I also add just a bit of liquid smoke which gives it the perfect hint of smoky flavor. I use my hands to just toss everything around and make sure it’s well coated. I generally use chicken breasts that are a little over than an inch thick at most. I would say if they’re any thicker than that I’d probably just cut them in half to make sure they get cooked through. I have an Instant Pot Electric Pressure Cooker, if you want to read more info about it, I’ve written about it, here! You could probably do an immediate steam release, especially since you’re going to shred the chicken anyway (immediate release tends to break food up a bit sometimes) but I generally let it sit for just a few minutes as I’m prepping dinner and then release. Your chicken should look nice and plump and juicy. I always pop an instant-read thermometer in there just to make sure everything is to temperature. It should be at least 165 degrees. Take the chicken out and shred it with two forks and pop it back in the pan and toss it with the juices. 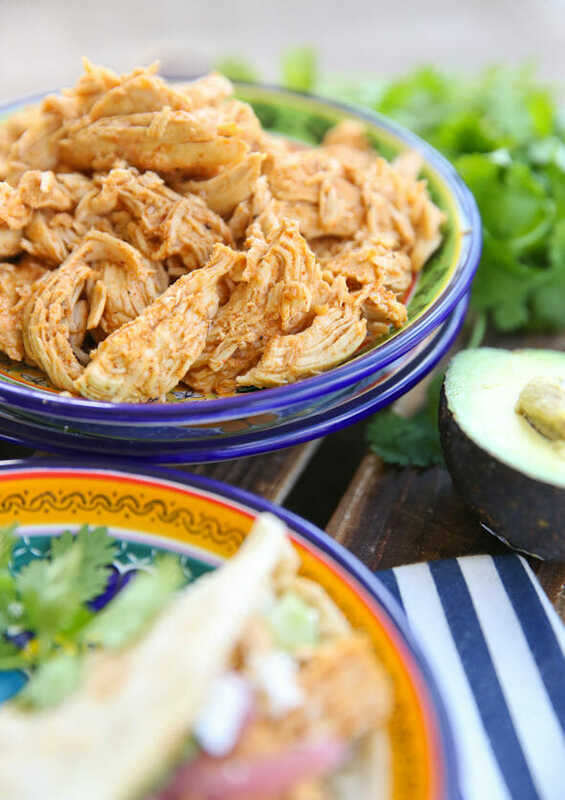 You’re left with really flavorful chicken, perfect for salads, tacos, burritos, you name it. It’s great to keep in the fridge to pull out for quick meals throughout the week. I love to have it on hand for meals while my kids are at school and I need a quick, healthy, filling lunch. It’s so easy to toss in a wrap, or in a bowl with leftover quinoa or rice and some veggies. Looking for more pressure cooker recipes? Try these! 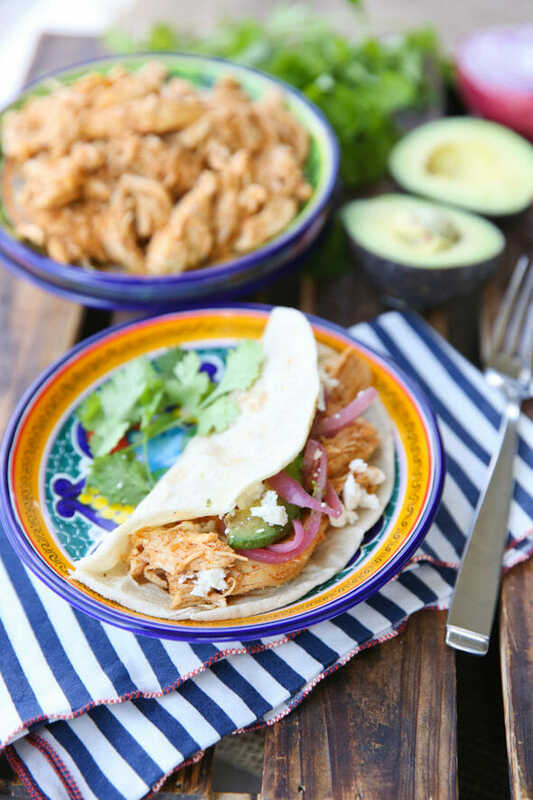 Quick and easy chicken with Latin flavors that works great for meal prep, tacos, salads, and more. If chicken breasts are more than 1-inch thick, cut in half. 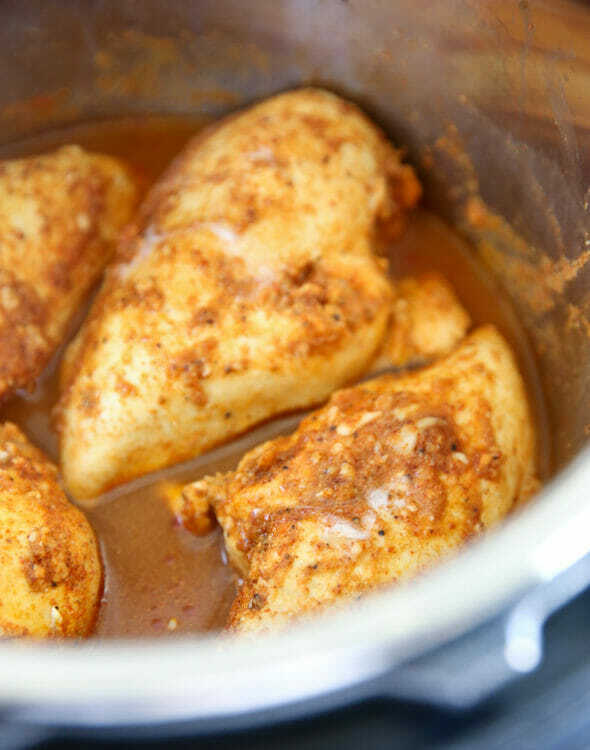 Place chicken in pressure cooker pot. Squeeze in the juice of both limes. Sprinkle all seasonings and liquid smoke over chicken and add garlic. Use clean hands to rub spice mixture all over all sides of chicken. Secure lid on pot and cook at high pressure for 6 minutes. When finished let rest for 5 minutes and then release steam. (Or if you’re short on time, just do immediate steam release). Check temperature of chicken with an instant-read thermometer and make sure internal temperature is at least 165 degrees. 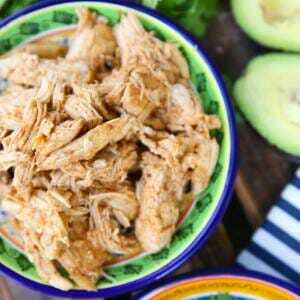 Shred chicken and return to pot and toss in juices. Season with additional salt and pepper to taste, if desired. If using frozen chicken breasts, I usually do 12 minutes high pressure. If using “thin cut” frozen (I buy them in bags at Costco) they cook in 6 minutes! This post contains affiliate links, you can read more about them here. Please keep the Instant Pot Recipes coming! This looks awesome and I will be trying it this week. This looks so yummy. Could you do this in a crockpot? If so, how long would it need to cook? Something new to try. Yay! You could definitely throw it in the crock pot, but I would cook it on low and it shouldn’t take too long to cook, you’d have to just check the temp to see when it was done! I love love love chili lime chicken! We’re going to have to try this recipe asap! This flavor profile looks right up my alley! Like you, I LOVE TrueLime, although I’m wondering where you buy your giant bottle. I get the 2.85 oz bottles on Amazon that you linked to, but if I’m seeing it right, your bottle is 10 oz! That’s awesome! I like a sprinkle of TrueLime in my water to jazz it up. I use mine all the time in recipes as well. I’m excited to make this chicken! I didn’t realize I had grabbed the link for the smaller bottle- here’s the updated link for the big one! Looks so great! I love TrueLime! If you use the TrueLime, do you add some water? I understood that a pressure cooker needs some liquid to work, but maybe the chicken is “wet” enough? Exactly- the pressure cooker does need liquid to create steam, but I’ve found that chicken breasts (plus the lime juice) provide enough moisture without turning it into soup! If you use True Lime, I’d add a little water or broth (just use the proportions on the container for the fresh juice equivalent). 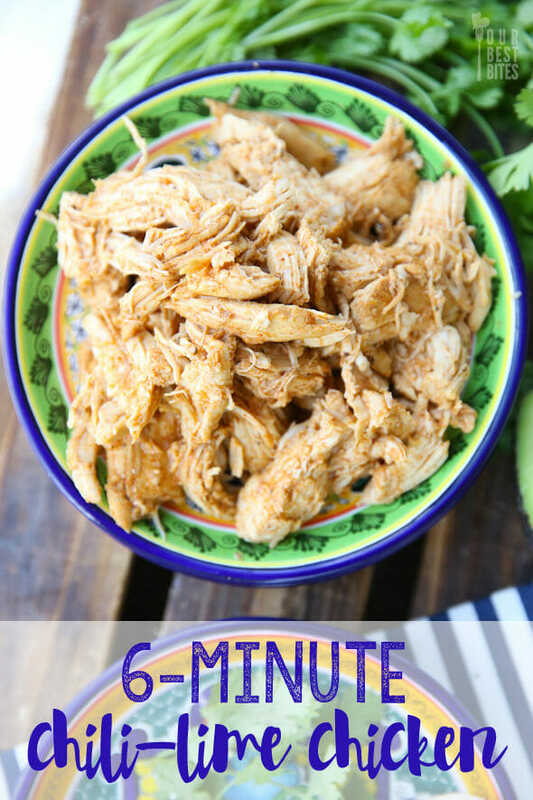 I’ve never done chicken in my pressure cooker because I was worried about how it would turn out, but I love the idea of chicken in 6 minutes! Thanks for great instructions and a recipe that sounds delicious and versatile! I was actually just coming back to add a note about frozen. I didn’t include it in the recipe because I wanted to test it more than once before leaving instructions. With frozen, you’ll need more cooking time- about 15 minutes should do it, for normal/thinner pieces of chicken. If the chicken breasts are enormous, you’d need closer to 30. I also add about 1/4-1/2 cup liquid since the moisture is trapped in the frozen chicken and you need some liquid to create steam. Chicken broth, salsa, even water are options, but it does dilute the flavor a little so I like to use something like broth to add flavor back in. I just went to the link and ordered a jar of the True Lime and True Lemon! I’m so excited to get it. My family is ADDICTED to citrus, and the bottled liquid lemon juice just doesn’t cut it. Also, I’m so so glad you’re doing these InstaPot recipes. I got mine for Christmas and I feel like a new mom (with way more time to spend with the kids after work since I’m not spending as much time prepping meals!). Keep them coming! Sara I love your posts! I bought the pressure cooker and am excited to try this. When you post, I can easily “Pin” it to my Pinterest board. When Kate posts, I can not. I have to copy and paste the URL. Just FYI. You probably know that, but just in case…it’s so much easier when you ad the “Pin” option. Recipe looks great, will definitely try it. But I’m finding myself very drawn to the dishes and bowls in the photos. Did I miss a post about them at some point? They are beautiful. Any information you can share? This is in my instant pot right now – I am so excited! Have you ever tried doubling the recipe? I’m wondering how that would change the cook time.. I haven’t, so if you try it let me know, haha! According to the manual, or the cookbook, I can’t remember which but just read it today, doubling the recipe doesn’t ever change the cooking time. Correct! Doubling instant pot recipes does not change cook times. Larger quantity of ingredients just takes longer to come to pressure. 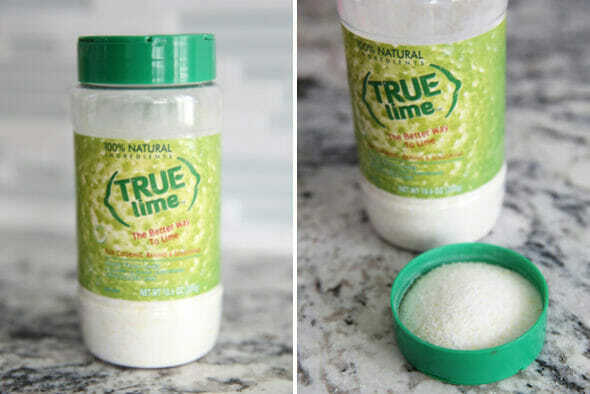 Have you tried this variation of True Lime?? It’s my new favorite! I’ve SEEN that online but never tried it! I’ll have to grab some! I am excited to get a pressure cooker, so please keep the recipes coming! This was SO delicious. Thank you! Is it 6 minutes from the time it starts steaming, or from when you put it on the stove? 6 minutes cooking time under pressure. Love pressure cooker recipes. Thank you! This is incredibly good! Loving my Instant Pot, and would love to see more recipes as easy and delicious as this one. Pressure cooking is a different style and sometimes it takes a few tries to figure it out so it’s just right. The first batch of chicken I made was HORRIBLE haha. If this turned out tough for you, simply adjust and try again. You may have had smaller pieces and therefor needed less time. I would knock the time down a little and go from there. Once you get it right, it’s perfection! have a new electric pressure cooker and tried this recipe. It was so very good! I would recommend it to anyone. The chicken was tender, juicy, and flavorful. My pressure cooker instructions state that I need to have at least an inch of liquid in the bottom of my pan when cooking. is a Hot Pot different in some way? Without liquid, I don’t there would be enough steam to build up pressure and have the valve automatically shut and start the cooking time. This works perfectly in my pot, and there is enough moisture (the chicken releases tons more) but all pots are different. If you need a little more for your pot, I would just add a little more lime juice and chicken broth until you have enough. Hope that helps! I love the idea of this but don’t have a pressure cooker. Would you recommend cooking in a crock pot, as mentioned in a comment above? Or do you think another way would work better? Yep, you could definitely pop it in a slow cooker. Probably low for a couple hours or so? You’ll want to cook it until it reaches 165 degrees. Did you place your chicken on the bottom of the pan or use the trivet? 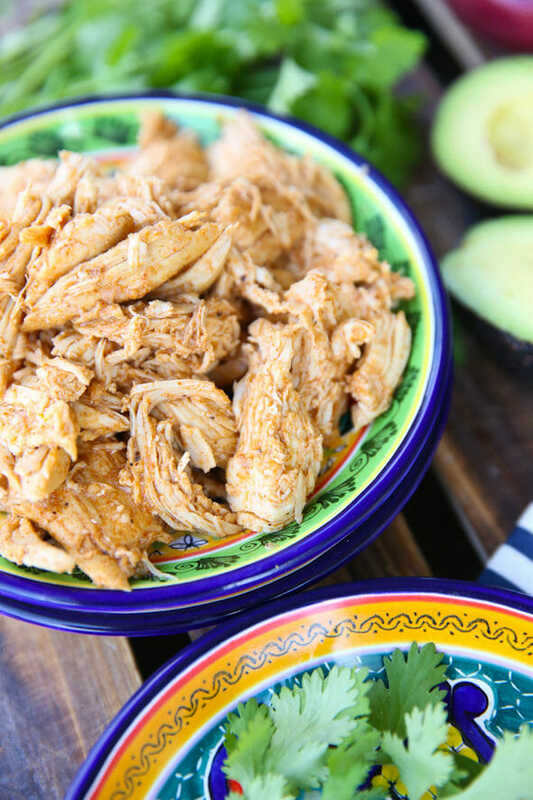 Made this tonight in the instant pot and it was a hit! Used frozen breasts (4 big ones) for 10 minutes. Added onion and cilantro on tortillas and everyone loved it. Thank you! When you say to cut the chicken breasts in half if thicker than 1″, do you mean cut them horizontally to make cutlets or vertically to make two halves the same thickness? Thanks! This recipe sounds so delicious! Yep, horizontally to make cutlets. And leave it for 5. Or do you let the keep warm program run? My pressure cooker just automatically stops cooking and rests, so that’s what I mean. You could certainly turn it off as well, either way works. Just to clarify, when the cook time is up in an Instant Pot, the heating element shuts off until pressure is released, then kicks in again to keep things warm. If the heating element stayed on, it would take much longer to release pressure, overcooking the food. Great recipe!! I followed your cooking time and it was perfect. I still can’t get over this pot. Tasty chicken for enchiladas cooked, shredded and ready to go within 40 minutes from start to finish. I had the True Lime and used 1/4 cup of water but probably could have used way less to hold on to more of the seasoning. Thanks for posting your recipe! I saw this post a few months ago and saved an Instapot to my wish list. Got it when it went on sale on Prime Day. So far I have made yogurt, chicken broth, rice, quinoa, Barbacoa and this chicken twice. The first time I had to slice it, it didn’t shred. Today it shredded and it is so good! I am trying to lose 30 pds after baby #3 and am starting my 2nd round of 21 day fix. This is perfect for the fix. I will be making a batch every week. Thank you! Oh my word. I made this for dinner tonight and it is amazing!!! Thank you so much for sharing a wonderful recipe for chicken. hi! should the chicken breasts be in a single layer? should I avoid placing them on top of each other? thanks! If using the True Lime, how much would I measure? And how much additional liquid? Just use the measurements on the package, it will tell you the equivalent! Just made this tonight and put it in burritos. It was delicious and you really can’t beat chicken done in six minutes! This is only my second time using the Instant Pot too! So moist! I was sceptical of using so little liquid, but I had IP beef chili that I made yesterday to fall back on if your recipe didn’t work. I shouldn’t have worried at all. I have to cook with no fat for my husband who has had a gastric bypass operation. This recipe and so many others I can make in my IP help us eat delicious food that is so very healthy. This recipe was flippin’ awesome! I guess my chicken breast were too big and I had to do 2 extra minutes. My kids wouldn’t stop eating chicken tacos! I’m new to the pressure cooking game and can’t thank you enough for this recipe. I’ll definitely be checking out your other stuff. 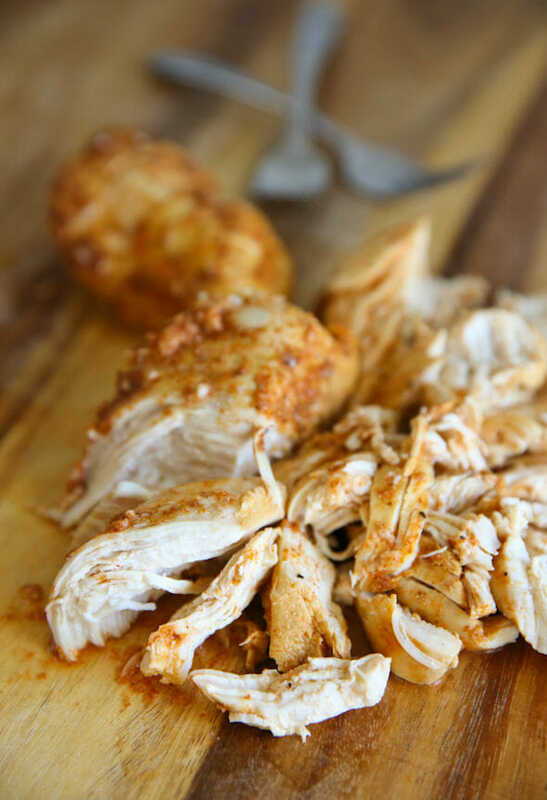 This chicken recipe is delicious! I added about 2 tsp of Frank’s Hot Sauce. My husband made a burrito. I put chunks over mixed greens with craisins and ranch dressing. Both very good! I cut the chicken breasts into 4 pieces each. The 6 minute pressure cook time was perfect. Thanks!!!! I’m new to the pressure cooker world and I would LOVE at OBB pressure cooker cookbook!! Can’t wait to try this later today. If I use 1.3 pounds of Chicken instead of 2 do you think I will need to cut my time down? I just got an instapot last night and I am so excited to try it! No it’s probably about the same. My husband got me an Instant Pot for Christmas. At first I was confused, but now that I see all the time it’s going to save me during the week, I understand why he got it! We tried this recipe tonight, and it was great! My husband was about to dump barbecue sauce on it, but after tasting it, he said “it stands on its own”. That’s high praise. Can the breasts be frozen when I put them in the instant pot? Yep! They just take a couple minutes extra to cook. Making this tonight! So fun to Google “Instant Pot Chicken from Frozen” and to come up finding YOU here! Yay Sara! I’ve bookmarked your page and my family is grateful. 😉 Hugs! This was amazing! My whole family loved it! Hi do you cook on a trivet. I thought you had to have some water in it to come to pressure? You don’t need a trivet in this recipe. The amount of added liquid from the lime juice, combined with the juice from the meats is enough to create pressure in the pot. Ok so no water, I know that you can do this with peppers. Just don’t want an explosion lol. Honestly not tons more- maybe just a minute or so. I’d start there and see how it goes! This is an amazing recipe! Just made it tonight and it turned out perfectly. I served it with a saute of broccoli slaw, a little rice and some “Slap Yo Mama” seasoning. Delicious! I’ve made this no less than 5 times and it’s amazing! My daughters (who are picky about meat) eat it without complaining. I’ve doubled it without a problem (I add a minute because I’m nervous like that). It freezes and thaws like a dream, too! How much cooking time for thighs as opppse to breasts ? Should be about the same! I made this last night and it was my first dinner using my instant pot. It turned out fantastic! Will definitely be making it again. Have you ever done frozen meat? I’m curious how long to cook frozen chicken for. ? Yep! Regular sized breasts usually take about 12 minutes on high pressure, and if you get the “thin cut” frozen (I buy them in bags at Costco) they cook in 6 minutes straight from frozen! Halved all ingredients (same time) without issue tonight for lovely shredded chicken. I didn’t have liquid smoke, so shook in a dash of smoked paprika for the smoky flavour. My crazy kids won’t eat it, but I loved it. Served with quinoa it was lovely, and I’m looking forward to having some of the leftovers in a sandwich with avocado. The just slightly over 1 lb of boneless skinless chicken breast I made divided into 6 servings with each coming in at 79 calories, 1.7 g of fat and 15.4 g of protein, for those counting. Thanks for the recipe! do you think the timing would be more or less using boneless, skinless thighs? I have about 6 lbs of thighs I want to use for a family party – this sounds like a good recipe everyone would enjoy. I know it only takes 6 minutes, but I’m going to be extremely short on time, would this be OK made the day before? Thank you for sharing this technique of pressure cooking chicken with less liquid! Using these instructions, I cooked 2 lbs of chicken breast with 2-1/2 tablespoons of green chile ranch seasoning, the juice of 1 lime, and 2 tablespoons of water. They were cooked perfectly after 6 mins and a 5 min pressure release. I then put the chicken and all of the accumulated juices into the bowl of my KA stand mixer fitted with a paddle attachment and shredded on low speed. Perfection! so apparently I used to much true lime…how much do you use? This recipe calls for 2 juicy limes, which is about 1/2 cup lime juice, so I would just use the conversion on the true lime label for that much. Hope that helps! Made this from 2 lbs of frozen chicken with your instructions above to add 1/2 cup of Chicken broth and pressure for 30 minutes. 10 minute natural release and it was outstanding, there was not a shred of chicken left after dinner! Used the excess liquid to flavor some steamed rice and it was great! Would you use this to make your taquitos or just cook plain chicken to make them? If you would use this recipe, would you change the ingredients in the taquitos recipe since it would already be seasoned? Thanks! Does it matter if you use the Poultry setting or Manual? Is there a difference between the two? Just use manual. I very rarely use those preset buttons because you just have less control over them. Just made this with bone-in chicken breasts (in a mini Instant Pot) and without the onion powder (which I didn’t have). Fabulous. I’m a newbie (1 week) to electric pressure cooking, but am already a fan, as an experienced cook. These werethe most succulent chicken breasts I’ve made ever — no more undercooked poached chicken breasts, over cooked roasted ones , or dicey sautéed versions for me. 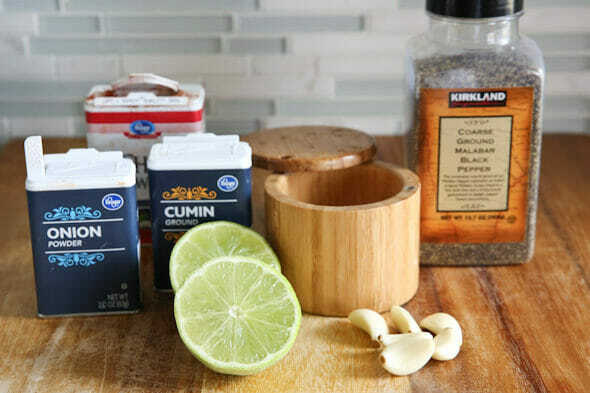 I loved these seasonings, but obviously the method is outstanding, and would accommodate all sorts of other flavors. I have made this several times now. We love it. We subsititue Rotel diced tomatoes and keep the juice as part of the liquid. I have done it with frozen and find about 15 minutes and natural release. You’ll lose that flavor component, but if you’re not a fan of it then I’d def just leave it out, no prob! Thank you very much for sharing this wonderful creation. It is undoubtedly the BEST chicken recipe I’ve tasted in a LONG LONG time. I served it over sautéed zoodles, with avocado slices on top and it was AH-MAZING!!! THANK YOU THANK YOU…. I’m off to scope out more of your recipes :D. NEW FAN!!!! I just bought an instant pot and I’m so excited to use it! I read your post about not adding the liquid that the booklet that came with the instant pot says it has to have (1 1/2 Cups). Your recipe looks and sounds delicious and I want to try it, but I want to be sure I don’t ruin anything…yep scared of the new appliance! so…don’t add the 1 1/2 cups of liquid and I’ll be fine? also do you do this with other recipes? Just wondering, cuz it sounds to me in some things I’d just be boiling the meat. HELP PLEASE and THANK YOU!! Super quick and easy. Love the Instant Pot. The chicken was done before my fried rice. Flavorful chicken. Will definitely do this one again.